Screen shot: Neither of these two YouTube videos for JustBeenPaid will load on a site associated with the purported "opportunity" -- but a repurposed video featuring billionaire investor Warren Buffett will. It is common in fraud schemes for scammers to trade on the names of celebrities and to suggest a famous person endorses a "program." There are the deliberate shills for JustBeenPaid — serial Ponzi board hucksters such as “10BucksUp,” for example. 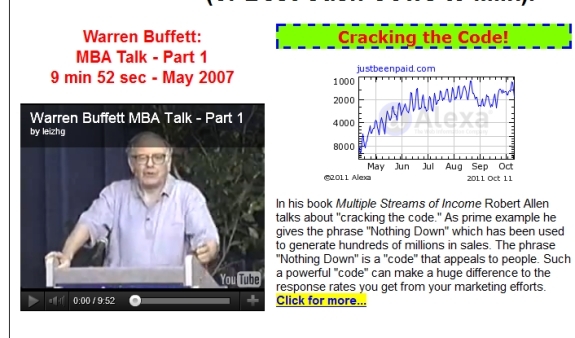 A YouTube video in which Buffett is giving a speech to a group of Florida MBA students is shoehorned into a JustBeenPaid promo at BigBooster.com. As Buffett arrives at the podium, he makes sure the microphone is working. The audience appreciates the line. This YouTube video of famed investor Warren Buffett is playing in a promo for JustBeenPaid on a website known as BigBooster.com. To its credit, YouTube has been removing JustBeenPaid videos at least for several days. But even as YouTube does the right thing by taking the videos offline in the age of epidemic white-collar crime and global money-laundering and Ponzi theft, the video of Buffett still plays on the BigBooster site. The likely reason is that there is no easy way for YouTube to associate Buffett’s 13-year-old speech at the University of Florida to a relatively recent BigBooster.com ad for JustBeenPaid, a “program” of recent vintage. Research by the PP Blog suggests Buffett delivered the speech on Oct. 15, 1998 — when Saddam Hussein still was presiding over Iraq and George W. Bush still was governor of Texas before being elected President of the United States more than two years later. A decade passed — as did the 9/11 terrorist attacks, Bush’s eight-year occupancy of the White House and the fall of Saddam Hussein — before the people behind JustBeenPaid apparently had the brainstorm of shoehorning the Buffett video into the BigBooster promo to help them sell a scam. YouTube’s removal of the JustBeenPaid videos poses only a minor hurdle, according to an email attributed to JustBeenPaid honcho Frederick Mann, who’s also the apparent braintrust behind BigBooster.com and a former ASD member. “We’ve started moving our videos to our own server,” the JustBeenPaid email attributed to Mann read in part. BigBooster.com appears to be hosted in South Africa; JustBeenPaid.com appears to be hosted in the United States. Both domains use a street addresses in South Africa that lists Mann as the administrative contact. If the program performs well, do some early compounding. Sponsor as many people as possible to earn referral fees. Withdraw your original risk capital as soon as appropriate to get into a “can’t-lose” position. Parlay, compound, or let run some of your profits. Much of the power of this formula is that it enables you to make money with programs that fail after a few months, but if a reasonably good program lasts 6 months or longer, you could earn tens of thousands. The message could not be more at odds with the principles for which Buffett stands, and yet Mann and JustBeenPaid incongruously sandwich him into the promo after previously leading ASD recruits to disaster. And even as JustBeenPaid tells members it is saying goodbye to Google’s YouTube, is is encouraging members to register for the “program” by using a Google Gmail addresses. “Gmail E-mail addresses work well with JustBeenPaid! – and they are free!” the firm informs prospects on its sign-up page. But it gets stranger yet: Payouts from JustBeenPaid come from an email address assigned to “michael” on the BigBooster.com domain, according to “I got paid” posts by shills on the Ponzi forums such as MoneyMakerGroup. And the cheerleaders and shills cheer on, even as a condition has developed in which the program is trying to rescue itself from collapse, offshore servers apparently are being brought into play — and the money is being routed from AlertPay in Canada to a murky business with footprints in both the United States and South Africa and the “opportunity” just happens to be trading on the name of Warren Buffett after previously pushing traffic to ASD. This is happening through a process by which a 13-year-old speech by the billionaire has been repurposed and made to load on the BigBooster site via YouTube — even as JustBeenBeen can’t get its own YouTube videos to load and even as it apparently is saying goodbye to YouTube while encouraging people to use Google Gmail addresses to sign up so they purportedly can get paid by “michael” at BigBooster.com for JustBeenPaid. Like JustBeenPaid, ASD had a tie to AlertPay. And ASD and a spinoff surf known as AdViewGlobal also used Gmail addresses and relied on videos to spread the scheme. On May 14, 2008, according to research by the PP Blog, ASD was touted on BigBooster.com as a “cash cow.” Less than three months later, the U.S. Secret Service alleged that ASD was an international Ponzi scheme that had sucked in tens of millions of dollars, routed money through Canada and was contemplating ways to get offshore. On May 14, 2008, BigBooster.com was touting AdSurfDaily. Great work as usual Patrick! This one has the potential to blow up with lots of people getting hurt. It’s on a “stealth” growth curve withing the Ponzi and Scam Forum and also through out relatively legitimate forums and groups, too, because of it’s presentation. I’m amazed at the number of otherwise cautious, legitimate marketers who have been sucked in and are promoting it. One Note: Not only is this an obvious ponzi when you get down to the “Black Box” analysis, but, there are no products, even “worthless value” products mentioned anywhere. Seems to be a straight money game unless I’m missing something. If the feds do go after the major promoters of ASD, it is going to be interesting to see if Frederick Mann, Hank Needham and Andrea Lucas are implicated and charged. They all three were major promoters of ASD. As I said earlier, the ASD case is just now geting into the really good parts, and more craziness and looniness is coming soon. They are just warming up, and we haven’t seen noth’in yet. Getting rid of ponzi schemers (or die trying) all over the world, except in Wall Street. Those big shark ponzi schemers got too many high caliber lawyers you cannot take on right Patrick Pretty? We’ve already heard that week argument over and over. Doesn’t justify your criminal activity one bit. Hang Tsen Gyu: Getting rid of ponzi schemers (or die trying) all over the world, except in Wall Street. Those big shark ponzi schemers got too many high caliber lawyers you cannot take on right Patrick Pretty? So are you saying that two wrongs make it right? Great defense in court. I hope you get to try it out to see how it works for you. I especially love Mann’s TOS where he says anyone who works for the government or provides information to the government cannot be a member. And then his being offshore keeps the big, bad, evil US Government at bay and they can’t touch him. Hmmm, Pedro Dispenza and Nick Smirnow said the same thing. Wanna guess what happened to them? Here’s a hint….they will soon be “visiting” the US to stand trial. And you are worried about Wall Street. I am amazed that everyone still thinks that this is Fred Mann’s show. I can report that after doing some very intensive spadework that Justbeenpaid is actually the brainchild of that guy who runs the webinars on JBP and who claims to be a mere employee. Yes Carl Pearson. He is the actual culprit. Him and Fred go back a long way, and they both have lots of ties with past scams. Just look at Carl’s past programs that left many holding the bag and had to get legal representation and make a lot of payments to people to keep himself out of prison. See Dollarmonster.com scammed twice both times Carl Pearson, see EasyChairClub again scammed, Carl Pearson again. I think he is way above being a mere employee, don’t you?? Maybe Patrick would like to pull up an article on Carl’s associations with scam sites. Would love to post that link into the JBP thread. Just a quick comment to say that the MMG thread for JBP and their own ‘inhouse’ web conference room is alive with anger about withdrawals some pending for 5 days have dried up. I was in there asking the questions, and the Moderators and management are very saying they know nothing about anything.. They don’t even know details of this convoluted restart which is also breaking down. JBP have stolen 65% of people’s accounts, and twisted the figures and then are pretty much refusing to put the matrix together. Looks like they have shot out of town, now that they have the money offshore ‘perhaps’. Also, the ONLY 3 people posting payment proofs are the last 3 people who seem to be pimping the thread…. strange that isn’t it? wanted to add after proof reading the above…. You should have asked questions at the many JBP forums, rather than posted it here. If you are not happy with the returns you are getting just get out and join some other better programs. Why should Brian not have posted here, john? I don’t know folks. Is it possible that JBP and JSS-Tripler ae good programs and that all we have to do is think outside our normal judgmental way of thinking. After all would the owner of the world’s most powerful social network give a program an endorsement if it were not so. Please cite your source for this, Hatfield. I’ll call Facebook on Monday to see if it is aware of the claim of a JSS Tripler endorsement by Zuckerberg.and to see if it can confirm the endorsement. I did a search on Google and found several links pertaining to this. You may want to do the same because I am not sure if I can post them here. If this is not the case, I do apologize. Nonetheless, I don’t know of any member who joined JBP who did not get paid. For me, this is no more of a gamble than amy business or investment these days. I only put in money I didn’t need and no more. So far, it’s working. Just thought I’d chime in and let everybody know that I am thoroughly pleased with my JBP results. True – the restart/move has been a partial fiasco. However, the site is back online and EVERYONE is earning. I took 950 to my AlertPay account two weeks ago and another 1,000 last weekend. Haven’t made up my mind what I want to do this weekend. I don’t understand why you all seem to be praying for the roof to cave in on me and the rest of JBP’s membership. True – the posse of moderators that has been installed during the restart are mostly incompetent and poorly equipped for any call to handle tough-but-rational questions. They have a tendency to confuse this as an attack on the program and they do not know how to respond with confidence. JBP needs to rethink this whole moderator thing. The conference room was a much happier and more productive venue before the moderators started pistol-whipping “infidels”. They cause more bleeding than they prevent. True – help tickets take too long to process, but at least they ARE processed. My several experiences indicate that it takes anywhere from three days to a week for a problem to be responded to and resolved. Not terrible when you stop and think about it. Also true – the restart/move has not killed the program. Far from it, JBP is alive and well AND growing by 500 and more members per day. Every member is earning and JBP’s status is “paying”… on time I might add. Also true – Frederick answers his email and is a thoughtful man to converse with. Did you know that he also holds regular phone conferences? Yup… sure does. Nice guy. Also true – Carl and Fred put their names on their work – unlike so many other mysterious program owners out there. Shame on anonymous program owners everywhere for being such cowards. Also true – everyone else in my downline is making money right along with me, including the guy at the “bottom”. Especially true – many of you seem very sore about losing money in the past. I know the feeling all too well. Your judgement is less than objective towards JBP. Can’t say I blame you for feeling upset about your losses, but you are making many criminal accusations without backing them up. You are also missing out on a great thing. Does anyone here have any evidence that JBP is stealing money? Thank you for allowing me to have my say. I appreciate it and I wish you all much success in your own endeavors. May your roof not cave in. P.S. – I like what that one fellow up there said: “Think outside the box”. Ha. you guys are getting slaughtered aren’t you. I did a search on Google and found several links pertaining to this.You may want to do the same because I am not sure if I can post them here.If this is not the case, I do apologize.Nonetheless, I don’t know of any member who joined JBP who did not get paid.For me, this is no more of a gamble than amy business or investment these days.I only put in money I didn’t need and no more.So far, it’s working. The Google links that reference a Zuckerberg endorsement are hardly authoritative, Hatfield. They read like Garbage In, Garbage Out to me — classic Ponzi GIGO, like the AdSurfDaily claim Andy Bowdoin received a special award for business acumen from the President of the United States. For heaven’s sake, ferstbaseman. JBP is a five-alarm scam that makes recruits affirm they are not government spies or media lackeys. The “offshore” jazz is just icing on this preposterous Ponzi cake. What say you to me BANKING 2000 dollars inside of the last two calendar weeks? Got one fellow in my downline who is now BANKING roughly 100 dollars a day thanks to Carl, Fred, and the masterpiece that is JBP. Quite a few others in the 30-50 per day range. We aren’t exactly millionaires but we are doing alright. All you can say is that you’re afraid of anything that Carl Pearson and Fred Mann are involved with? And the reason for this is because you lost money in a past program of Carl’s that was swept away by a processor which grew hostile towards MLM transactions? Even though Carl offered members a recuperation plan? You all know the rules – don’t risk what you can’t afford to lose. MLM can be a risky business. There are many variables that can wipe you out. JBP is a fine attempt to eliminate this risk, and we appear to be passing our first big test – the restart. It’s as though you WANT us to fail. You seem so excited by the idea regardless of any affect this would have on the well-being of JBP members. I challenge you to examine your conscience. Would you really prefer championing the managers of our U.S. government? The people running it are heading the largest scam on the planet – yet you still back them? Sad to say because I love my country and all that it stands for – in theory – but Washington has been highjacked by people who are more crooked than Lombard Street and the SEC COMBINED. Surely THEY are not your inspiration for success? Why not open a JBP account and try it for yourself? I’ll even teach you the ropes. I guarantee that you will never have been so glad to be wrong. ferstbaseman: What say you to me BANKING 2000 dollars inside of the last two calendar weeks? If you banked $2,000, I’d say your bank is in possession of $2,000 from an international Ponzi scheme spread in part by shills on the Ponzi boards. Because the shills were participating in other Ponzi schemes, I’d say the $2,000 in your bank is something that approaches radioactive. And because Frederick Mann identified himself as a recipient of “over $6,000” from AdSurfDaily, I’d say that Mann’s well is tainted by Ponzi proceeds that came from a man (Andy Bowdoin) who is under indictment for running a Ponzi scheme. In short, I’d say your well is poisoned, meaning your account in the bank’s well is poisoned, meaning that any of the $2,000 that leaves your account will taint other wells — the collection plate at your place of worship, the store at which you purchase your football snacks, the gas station at which you fill up your car, the cable company that keeps you online, etc. ferstbaseman: the masterpiece that is JBP. Good grief. Mann and Pearson as Van Gogh or Rembrandt now? Their multifaceted Ponzi drawing lifeblood from Ponzi boards listed in federal court filings is a work of art? What it is is a recipe for pain that is being enabled in part by AlertPay, one of the e-golds and e-bullions of Canada. Both AlertPay and SolidTrustPay are referenced in court filings in the AdSurfDaily case — as are egold and ebullion. And, of course, members of Centurion Wealth Circle and “The Tornado” also said AlertPay processed payments for those down-and-out schemes. ferstbaseman: It’s as though you WANT us to fail. You seem so excited by the idea regardless of any affect this would have on the well-being of JBP members. Was “10BucksUp” one of your students? ferstbaseman: Would you really prefer championing the managers of our U.S. government? The people running it are heading the largest scam on the planet – yet you still back them? Sad to say because I love my country and all that it stands for – in theory – but Washington has been highjacked by people who are more crooked than Lombard Street and the SEC COMBINED. Surely THEY are not your inspiration for success? The evilGUBment bogeyman, too? That’s straight out of the ASD playbook. Problem is, it doesn’t give Mann and cheerleader Pearson a license to run a Ponzi scheme. And the bid to force JBP members to affirm they are not government spies or media lackeys is straight out of the Legisi Ponzi scheme playbook (and also AdViewGlobal). It fairly reeks of paranoia, an element of many Ponzi schemes — ASD, AdViewGlobal, Legisi, for three examples. But you want to “teach” people the “ropes,” so they can bank $2,000 just like you — never mind where it came from, never mind its corrosive effect on any downstream person or entity that comes into possession of the funds, never mind the Buffett, Oprah, Zuckerberg and “Mr. Spock” deceptions, never mind the suspended YouTube accounts of the champions of JPB, never mind the promotional ties to other fraud schemes. Every time a poster such as ferstbaseman arrives here to “defend” an obvious Ponzi scheme, I am reminded of d_b’s classic observation that, even in the face of an amputation and profuse bleeding, the apologists will describe it as merely a flesh wound. It’s one that always will stick with me because the language was so economical and the imagery was so vivid. Some readers may find this story instructive. It’s on what can happen when Ponzi proceeds get deposited into a bank and ties among various schemes promoted on the Ponzi boards. ferstbaseman: and social security works like…. ? The Social Security deflection, too? LRM is right: The script never changes. Ah, the old “Social Security is a Ponzi” argument. The main problem with that is that Social Security was enacted by Congress. Want to know how many of the online Ponzi’s can say the same thing? None. So stop using this as an argument. Be honest and admit that you are a crook and know what you are going is illegal. It will save time during your criminal trial. Oh, and Ferstbaseman, thanks for admitting online what you made in a month. I’m sure the IRS and the DOJ appreciate it. Too late now to include another cliched HYIP ponzi players rationalization. You should have included that one in your first post here and you would have taken the prize. Well I wonder how much they were paid to come into this comment stream? I would say that ferstbaseman:is either CyberCeo or Beechworks. They are the 2 main pimps for the program that has ’employment ties’ to the scam. You can decipher it from the eloquence or mood derivatives that they leave behind in their forum posts. I can tell a mile away…. Sometimes it is like leaving a fingerprint at the scene of a crime. Quick note: I contacted Facebook this morning about the purported Mark Zuckerberg endorsement of JustBeenPaid/JSS Tripler. Not sure if Facebook will have a comment or not. So far, JustBeenPaid has been trading on the names of Warren Buffett, Oprah Winfrey, “Mr. Spock” and Zuckerberg — with a passing, Ponzi board reference to Charlie Sheen. There also are some JustBeenPaid-related sites on Facebook. Longtime readers will recall that DNA, the Phil Piccolo scam, traded on the names of Oprah and Donald Trump. ASD traded on the names of then-President Bush and then-Vice President Cheney. ClubAsteria traded on the names of the World Bank, the American Red Cross (and other charities), Will Smith and Mahatma Gandhi. Well, looks like the jbp ponzi scheme is still up and running paying out money to members! Ironic. A feeble minded like I am, earning money far more than I put in. Technically I won’t and ever will loose money coz I already withdraw what I put in there. What money I have in the program is the money I earned from it. Ponzi or not, I am earning more, everyday. Isn’t that just so stupid of me and the ponzi program. Hey littleroundman, can you hand me over that prize you were talking about? Thanks in advance! Good grief people! Wake up! Carl: Thanks in advance! Good grief people! Wake up! I can’t hand it over. It’s already been claimed by some guy named CandyMan. Apparently he “makes money” by selling recreational chemicals on the street corner, so, he claimed the prize. As “making money” seems to be the only criteria by which you operate, I’m sure you’ll understand. Carl: Well, looks like the jbp ponzi scheme is still up and running paying out money to members! Ironic. I’m not sure how an ongoing Ponzi scheme qualifies as “ironic,” though. Please explain the irony. Carl: A feeble minded like I am, earning money far more than I put in. Technically I won’t and ever will loose money coz I already withdraw what I put in there. What money I have in the program is the money I earned from it. Ponzi or not, I am earning more, everyday. Carl: Isn’t that just so stupid of me and the ponzi program. If you’re arguing you are “stupid,” I’d disagree. I’d say you are smart enough to position yourself to receive money from an enterprise you know to be a racket. Capone had the same sort of smarts, as did Scott Rothstein, the infamous Fort Lauderdale attorney/racketeer/Ponzi schemer. Rothstein now is doing a 50-year tour of the federal prison system and singing like a canary on birdie steroids. I dont understand the commotion. I see it as a gamble. When I go to a casino I know I will loose my 100 dollars. Playing this game I know I will receive 2% a day. My risk will be 2% lower each day, and after 50 days I have no risk anymore. If it stops I lost my gamble. If it continues I win some money. As a gambling operation, if that is how you view it, it would be an illegal business anywhere in the world. As an investment, it is illegal in the US and most countries. Your risks and ability to recover $ is worse than just 2% per day. You have the risk of not being able to withdraw your money like most on MMG and TG have been complaining about. You have the risk that a “reset” reduces your principal. You have the risk that the whole system shuts down and the money disappears. Jimmy: As a gambling operation, if that is how you view it, it would be an illegal business anywhere in the world.As an investment, it is illegal in the US and most countries.Your risks and ability to recover $ is worse than just 2% per day.You have the risk of not being able to withdraw your money like most on MMG and TG have been complaining about.You have the risk that a “reset” reduces your principal.You have the risk that the whole system shuts down and the money disappears. You also have the risk that, if JBP is closed down by the authorities before it implodes, you have received money from an illegal enterprise. The sorry part is that, I guess, some people don’t care where their money comes from – even if it comes from the losses of their own recruits / downlines – as long as they get paid. 1610PJ: I dont understand the commotion. I see it as a gamble. YOU see it as a gamble. Does that mean everyone sees it as a gamble ??? If it’s just a “gamble” why do Just Been Paid and its’ supporters go to such great lengths to convince people it’s a legit business ?? Still, you got yours, why should you care if others are being ripped off by a “gamble” they didn’t know they’re making ?? And today there was a “restart”. Looks like the risk is a lot worse than just time to recover “2% a day”, huh? Can we try that once again, only in English this time ? ?